One of the four main islands of Japan, Kyushu has a sub tropical climate, so it is blessed with a lot of green areas, where palm trees grow tall and hibiscuses decorate the seaside towns. There is no end to the activities or the sightseeing spots, so limiting myself to just a few is definitely a challenge. But here is my top 20 for this gorgeous island. Fukuoka is probably the biggest town in Kyushu and historically was an important hub for traffic and commerce from both China and Korea. But perhaps the best thing to do while in Fukuoka is to walk around Nakasu District. The area is directly facing the Naka River and it is along the riverside where all the action happens: a long line of yatai (small ramen stalls) are luring passersby into eating some of the best ramen in the country (let me remind you that the chain Ippudo serves Fukuoka style ramen). Canal City is a modern mall and shopping complex that takes the name from an artificial canal running through the complex. It is defined as a city within a city, just because one can find everything in there, from food to clothing, from entertainment to amusement, and there is even a hotel. Also, in the center of the canal there is a fountain and every hour (or maybe less) a water show with music is played, for the joy of all people small and big. The city of Kumamoto is full of interesting sights. One of those is the castle, which was built on a hill overlooking the city and was surrounded by thick and tall walls that made it more like a fortress. The castle, like the majority of all Japanese castles nowadays, had to be rebuilt due to fires and other disasters over the centuries, although a few turrets are still original. A visit inside is recommended, as some of the main palace rooms, opened for the occasion of the 400th anniversary, are of unique beauty. If not for the tour inside the castle, visiting the castle during cherry blossom season is a must, as about 800 trees dot the premises. There is no doubt in the Japanese minds that Saga prefecture is where ceramic pottery began to be produced. The three villages of Arita, Imari and Karatsu are the most famous for learning about the origin of pottery, with all the smaller and larger museums on the art of ceramics both in Saga City and in these villages, and also for buying original pieces. All cities show the distinctive chimneys of the many kilns used to cook the wares. Depending on the provenance of the pottery, their style is distinctive. Pay a visit to one of those villages and get your unique piece of Japanese ceramics! The Kyushu National Museum in Dazaifu is the fourth and the newest of all national museums in Japan and is also built in a way that it is protected for safety and disaster prevention. Also, a very modern and catchy tunnel connects the main shrine in Dazaifu with the museum. The exhibition rooms are spread over four levels, mixed with all sorts of modern facilities, such as full-access accommodations for disabled people (even for assistance dogs! ), rest rooms, medical rooms, plus a cafe and museum shop. There are permanent and special exhibitions that aim at giving an overview of Japanese culture, and there are also temporary or seasonal exhibitions from artists worldwide. In addition, the museum features an HD theater and an interactive exhibition room where people can touch and hear, other than see, the items. National treasures and important cultural properties find a space within the museum. Another pretty spot to visit in Kumamoto is Suizenji, a Japanese style garden that will immediately put visitors in a relaxed state. The garden design is such that its landscape represents the miniature of 53 post stations along the old Tokaido Road, the old highway that connected Edo (Tokyo) to Kyoto. There even is a miniature green lush rendering of Mount Fuji! They say it rains 32 days a month in Yakushima…indeed, the island, south of Kagoshima, is the rainiest place of Japan and hosts a unique ecosystem that was listed as one of the world UNESCO sites. If you like the outdoors: forests and waterfalls, hiking through moss, fog and mist, and want to see the real life settings of Hayao Miyazaki’s Princess Mononoke, then Yakushima Island is the place for you. So pack your tent and plan a weekend there. The island can be reached by airplane or by ferry (from Kagoshima), and staying one night over is the best way to experience what the island has to offer. Due to the rainy, tropical climate, it is advised to always check for the latest news or advisories. Also, it is very easy to get lost in the lush and thick forest, so to enjoy hiking at its best, hiring a guide is recommended. 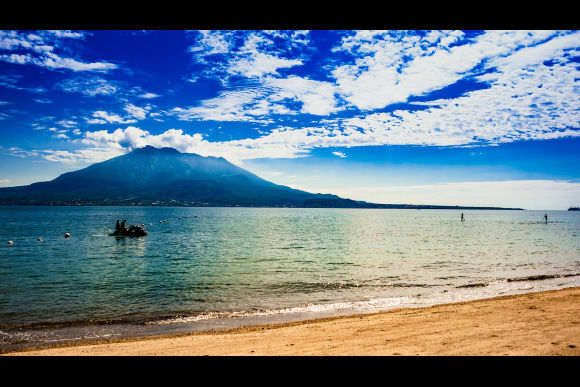 The symbol of Kagoshima, in the south of Kyushu, is definitely the volcanic island of Sakurajima, that’s attached to the mainland by a simple strip of land. Actually, the volcano was once an island, and the land is indeed the result of an eruption in the early 1900’s. Even now the main way to get to the volcano is by ferry. It is still very active, often coughing out puffs of ashes and volcanic dust that can linger around for several days. Tremors in the ground and small eruptions are common there, but excursion to the island and hiking to the various observation points are possible (up to 2km from the crater), provided that safety is ensured first. Always double check with local authorities and read notice boards or advisory notes before going. Say you are in Sasebo city, near Nagasaki, but have had enough of the Japanese temples or food. You are in luck, because Sasebo is home to a theme park that will immediately transport you to Europe. The park is made to look like the Netherlands, with canals like in Amsterdam, windmills and tulip fields, squares with cafes, and other reproductions of various symbolic buildings and places from Holland. The theme park is located by the seaside, occupying a large part of Omura Bay. This means that other than touring the “city” canals, visitors can also tour the bay (or reach Nagasaki Airport directly from there). There are hotels right outside of the park, for those who want to stay overnight, and all restaurants serve European food. The park could be a perfect place for families with small children. The city of Nagasaki is known for the horrific destruction of the atomic bomb drop on August 9, 1945, but it has recovered and is now a beautiful and lively city. Still, it is important not to forget about the terrible history of Nagasaki. The museum develops over three floors, two of which are underground. The exhibition–relative to the atomic bombing–takes visitors from the pre-bombing state of the city through the devastation caused by the war and then a last section aims at making people reflect on the future. Photographs, videos and remains of buildings and items are displayed across the rooms. If visiting the museum is too much for you, you can head to the nearby peace park where the green and the nice sculptures will help to lift you up. One of the most famous beaches in Miyazaki is Aoshima, a small seaside town with white sandy shores. A tiny flat islet, covered in lush vegetation (and that’s why it is called Aoshima, which means ‘green island’) and surrounded by picture-perfect beaches, is connected to the mainland by a thin sandbar. Days flow slow here, and the tropical sun is strong, so remember to reapply high SPF sunscreen regularly. This place is a real natural wonder located at the geographical junction of the three prefectures of Oita, Kumamoto and Miyazaki. In here, old volcanic eruptions of Aso over the centuries managed to carve a lava stream as deep as 100 meters through the rocks. Water now flows along the cracks, creating a stunning gorge, where the blue water meets the black of the cliffs and the green (or red) vegetation. Either a hike along the stream, or a light rowing boat excursion will certainly be memorable. The caldera basin that includes Mount Aso, between Kumamoto and Oita prefectures is the worlds biggest, extending for about 90 km. The volcanic and geothermal activity in this area is strong, although people can experience the view of a crater of an active volcano safely. The peak can be reached via ropeway or by car, provided that no advisory or warning bulletins are issued. Mount Aso area, together with Mount Kuju area, forms the Aso-Kuju National park. The nature here is amazing, the plain and all mountains are coated by a thick green layer of vegetation, and the mountain ranges that can be observed from the various observation points takes peoples breath away. The caldera of Mount Aso can be reached within 1 hour from Kumamoto by bus. The east coast of Kyushu belongs to Miyazaki prefecture. Being a tropical region prone to typhoons, Miyazaki prefecture is perfect for surfers and it is indeed internationally known for this sport. The best time to surf is between August and November, when the ocean waves are biggest, and access points to the many beaches that line the coast are everywhere. Nagasaki was one of the first cities in Japan to open to foreigners after centuries of seclusion. Located on a hill overlooking the port there are several traces of the foreign presence, and Glover Garden is one of those. A former area of foreigners’ settlements, Glover Garden is now an open air museum where houses of rich British and Scottish merchants were built. The name is taken after Thomas Blake Glover, who started green tea commerce with Japan and ended up living the rest of his life there. If you happen to visit Kyushu in winter, make sure to visit the town of Umi. This town, other than beautiful natural sceneries, offers a nice trail walk or hike to see some impressive icicles, Nanshogataki, also known as icicles of Gouradani. It is in the deepest of winter, when the water that flows through the mountains freezes and forms 20 meter high icicles (those are the drops of the waterfall). There is also a campsite nearby, the Umicho Showanomori Camp ground, that is perfect for those who wish to spend a few days there. In the past this town, close to Fukuoka was the most important center of Kyushu. This is the reason why the now small, quiet village boasts many temples and visitors can find traces of the military and political past. Among all temples, the Tenmangu Shrine is the most visited (by students) as it is the temple dedicated to Tenjin, guardian god of students, but it is elaborately decorated and preceded by a paved walkway lined with shops. Komyozenji is another famous temple featuring an exquisite garden in the back. Beppu City is famous for being a geothermal heaven, and it very much looks like a boiling pot letting steam off. In addition to having several hot spring bath houses that alone produce more water that the rest of Japan (Beppu Onsen, Kannawa Onsen, Myoban Onsen, Kankaiji Onsen, Hamawaki Onsen, Kamegawa Onsen, Horita Onsen and Shibaseki Onsen), it has also a group of 8 hot springs that are forbidden to bathe in. These are known as Jigoku onsen (hell pools), because the temperature of the water streaming out from the earth is around 100 degrees celsius. They all look very pretty, with their varying colors, but they are deadly. There is the possibility to do a tour of those pools, by purchasing a carnet of tickets that allows discounted entrance and bus transportation. Although highly touristic, I think this tour is very interesting as it puts us in touch with the forces of nature. Another thing Beppu is famous for, again related to the high geothermal activity of the area, is the sand bath. The sand is naturally heated, and it is said to benefit the body in several ways. The easiest way to try a sand bath is to head to the Beppu Beach sand bath, just a few minutes from Beppu station, where you’ll be buried neck to toes with an ocean view. If we mention Hashima Island, probably not many people will immediately know what we are talking about. Gunkanjima, in fact, is the nickname of Hashima, and means ‘battleship’ in Japanese. The reason of the nickname lies in that this island, a few kilometers off Nagasaki coast, was built up in order to accommodate for the thousands of coal mine workers that had jobs on the island, such that it came to resemble a battleship. Once the mining was ended, the island was abandoned, but since about ten years ago, boat tours are offered to visit the island to have a glimpse of the life as it was once conducted there.